Overhead view of the Alexander Hybrid. Combining the most innovative foam on the planet and the support of high quality individual coils with extra edge support, the Alexander Hybrid Signature Series provides a combination of supportive pocketed coils and pressure relieving foam. A soft quilted, luxurious top layer of fabric greets you and provides a cool, comfy surface. The top layer of convoluted foam provides an ergonomically supportive surface and a more airy, breathable surface than traditional flat memory foam. This can help your body regulate its ideal sleeping temperature. Just below is a layer of cooling Copper Infused Memory Foam, the most innovative foam on the market today. Copper is known for its antimicrobial properties, but also its conductive properties. Heat is pulled away from your body into the copper, making this mattress sleep very cool. Copper is actually infused into the foam. No other mattress on the market today uses this innovative foam, we are the first! The Alexander Hybrid Mattress utilizes a very durable individually pocketed coil unit with edge support coils all around the perimeter. This provides a movement-free sleep surface and supports the back perfectly. 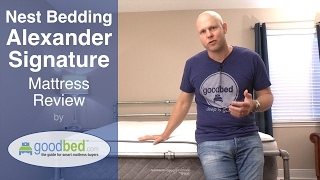 Is Alexander Hybrid the right bed for you? Based on 497 real owner experiences with this brand. How do people like you rate their Nest Bedding Alexander Hybrid mattress? Mattresses are personal. Filter the 497 Nest Bedding Alexander Hybrid ratings by sleep position, weight, age, gender and more to find the ones that are most relevant for you. 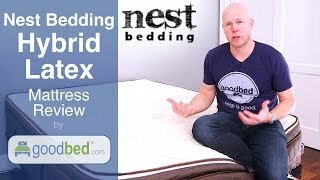 The Nest Bedding Alexander Hybrid line is recommended by 81% of owners on GoodBed (based on 497 ratings + 179 reviews). 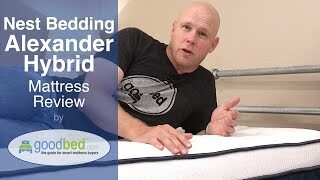 Want more reviews from Nest Bedding Alexander Hybrid mattress owners? Do you have a Nest Bedding Alexander Hybrid mattress? Write a Review! Have a question about Alexander Hybrid products or stores? Mattress Thickness: 13" to 13.50"
Note: The product line specifications above were derived from the active Nest Bedding Alexander Hybrid models listed on GoodBed. As a result, these details may not be comprehensive and may not apply to all Nest Bedding Alexander Hybrid models. If you are seeking specifications for a particular Nest Bedding Alexander Hybrid mattress, please search for that mattress by name on GoodBed, or check with your local Nest Bedding Alexander Hybrid dealer. The Most Comfortable Mattress on the Internet. The Alexander Hybrid product line is a collection of mattresses released in 2014 that is manufactured by Nest Bedding. Have an update or correction to our information about Nest Bedding Alexander Hybrid? If so, please take a moment to suggest an edit. 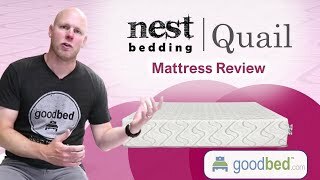 Nest Bedding Alexander Hybrid mattresses sold by Nest Bedding come with a 100-night in-home trial. Nest Bedding Alexander Hybrid mattresses are only available online or through Nest Bedding stores. Click here to check for a location near you.